In the present day highly competitive environment, the most important asset for an organization is its manpower which is a major factor in differentiating a highly successful organization from an organization which is struggling. Successful organization uses succession planning to develop and maintain strong leadership in all the critical positions and to ensure that this leadership has all the skills and competencies needed for the success of the organization in the environment under which it operates. An organization cannot have strong and capable employees in every critical position by concentrating its efforts only on recruitment and training. For this a systematic approach to succession planning is needed. Succession planning is perhaps a necessary component of the management efforts in building the organization and it helps tremendously the organization in achieving its strategic goals. Unfortunately, planning for succession is often overlooked or occurs when it is too late i.e. after key people have left the organization and there are no right internal candidates to fill the key positions. However If the organization executes succession planning in a right way then it fully prepares the identified personnel to step into positions left vacant because of retirement and general attrition. The primary task of succession planning is to plan a sequence of personnel moves so that candidates for key positions are known in advance of actual need. This prior identification permits opportunities for mentoring and developmental activities to improve a person’s readiness to succeed to specific positions. It also provides concrete decision making information necessary to minimize the chance of poor selections or the adverse impacts of unforeseen vacancies that can disrupt the continuity of proper management of the operations in the organization. Succession planning is a process whereby an organization ensures that employees are developed to fill each key role within the organization. Through the succession planning process, organization has superior employees, develop their knowledge, skills, and abilities, and prepare them for advancement or promotion into ever more challenging roles. Actively pursuing succession planning ensures that employees are constantly developed to fill each needed role. As the organization expands, loses key employees, provides promotional opportunities, and increases sales, then succession planning ensures that the organization has employees on hand ready and waiting to fill new roles. Succession planning is defined as a purposeful, concentrated and systematic effort made by an organization to ensure leadership continuity, to retain and develop knowledge and intellectual capital for the future, and to encourage individual employee’s growth and development. The concept of succession planning includes identification and development of successors for the key position in the organization. Succession planning process is a continuous process in an organization. Succession planning is also defined as a conscious decision by an organization to foster and promote the continual development of employees, and to ensure that key positions maintain some measure of stability, thus enabling the organization to achieve its mission and objectives. Succession planning is also defined as a process for identifying and developing internal employees with the potential to fill key leadership positions in the organization. Succession planning increases the availability of experienced and capable employees that are prepared to assume the key roles as they become available. Succession planning is a systematic approach for the following activities in an organization. To build in the organization a talent pool and a talent pipeline for ensuring the continuity of leadership when the employees in key positions leave the organization either due to retirement or otherwise. Succession planning recognizes that some positions are the life-line for the organization and they are too critical to be left vacant or filled by anyone but the best qualified persons. Effectively done, succession planning is critical to the success of the mission and objective of the organization and creates an effective process for recognizing, developing, and retaining the necessary talent in the key positions within the organization. Succession planning is more than just an organizational chart which shows the reporting relationship. It is also different from replacement planning which constitute filling of a position in the organization when it falls vacant. Succession planning can help organizations foster ‘total people management’, a dynamic component of the desire of the organization to build a performance culture. Traditionally, succession planning takes sometimes a replacement approach in some organizations which often focuses on the executive level positions. One or two successors are usually identified and selected in these organizations probably based on the exclusive input of their immediate supervisor, and then placed on the fast track into a senior position. Normally there are three approaches to succession planning. These approaches are given below. Simple replacement planning – This approach consists of a process that indicates possible internal replacements for critical positions. 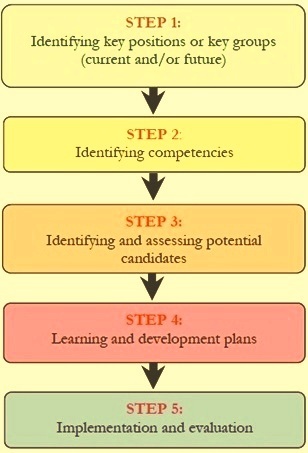 Developmental succession planning – This approach is a process that indicates not only possible internal replacements for critical positions but also provides for developing individuals to meet the challenge of future organizational change by grooming them for advancement possibilities and for exercising increasing technical proficiency. Talent pool planning – This approach is a process that indicates a group of possible internal replacements for critical positions and also provides for developing groups of people to meet the challenge of future organizational change. However, succession planning has evolved into a process that can be used for the following. To ensure a continuous supply of talent by helping employees develop their potential, as successors for key departmental positions. Succession planning is an ongoing, dynamic process that helps an organization to align its organizational goals and its human capital needs. To achieve outstanding results, the organization must develop an effective and highly focused strategy towards succession planning. Succession planning can also be an extremely powerful tool in motivating and retaining top leadership. Senior management team is personally involved. Succession planning is aligned to the organizational strategy. There is a well laid down procedure for the selection of employees in the talent pool. The determination of the competencies of the employees is based on the objective analysis of the identified data of the employees. The assessment of the competency should include how well prepared employees are to assume additional or specialized responsibilities. There exists a long term plan of the organization which along with other things also identifies the need of manpower at various positions. Succession planning is to be done to fulfill this need. Employees short listed for talent pool must be committed to their self development. The development plan of the employees in the talent pool is well defined. The employee’s development planning process is to be such that helps to narrow the gap between current competencies and current performance and the needed future competencies and potential. There are clear goals of succession planning and they are to be integrated with the human resource (HR) planning strategies in the organization. The progress of the employees in the talent pool is to be closely monitored and corrective actions are required to be taken if any deviation is observed towards meeting the objectives of the succession planning. The organization is to have a measurement method that assesses how well the succession planning system is functioning over time. Most importantly succession planning is to be flexible and open to changes and any modification is to ensure maximum benefit to the organization. Fundamental to the succession planning process is an underlying philosophy that argues that top talent in the organization must be managed for the greater good of the organization. For this it is necessary that there is a talent mindset as part of the top management culture for the succession planning process to be effective. It is important to acknowledge that succession planning can vary slightly between different organizations. Different resources, different organizational designs and different attitudes all mean that succession planning is to be flexible and adaptable in order to accommodate varying needs and to achieve work continuity in the organization. However, there is a general framework that organizations can use as the basis and guide for their succession planning activities. This framework is given in Fig 1.